When do you need advocates who understand the value of prevention? Yesterday, today, and tomorrow! You need people on board with you at all times who understand the value of fire prevention. They will give you needed support for sustaining a comprehensive prevention program. You will also make specific programs more effective with additional support from community partners who have a connection to those program objectives and audience. Maintain relationships with leaders and stakeholders who understand the value of prevention. They can support the value of a strong, sustained community prevention strategy. It makes sense to maintain communication with the influencers in your community on a continued basis. Their understanding of programs and activities that protect the community by reducing risks and saving resources can be the support you need if prevention programs and personnel are threatened by budget cuts. Some ways to maintain this understanding and support might be to 1) include them in regular updates and reports of activities, 2) let them know about successes and include them in those celebrations, 3) invite them to be part of or observe prevention activities and events, and 4) involve them in discussions and program planning. When the Philadelphia Fire Department needs public education resources, CFPC steps in to help out when possible. “In these times of economic restraints, it’s great to have a partner,” Flores says. Fundraising to cover expenses for educational outreach is CFPC’s priority and the group seeks in-kind and financial contributions. “In-kind contributions are among the most valuable donations we receive,” he says, noting educational billboards and other public signage as effective examples that would be beyond the budget were they not donated. Keeping the CFPC volunteers informed and motivated on an ongoing basis is an organizational priority, says Flores. There is an annual dinner dance/award ceremony during Fire Prevention Month to thank the committee members. Twice yearly luncheons are also an opportunity to welcome new members, swear them in and help them get acquainted with the CFPC priorities. In 49 states, fire and EMS personnel are increasing their nonemergency capacity through partnerships with nearly 20,000 Fire Corps volunteers. This diverse resource enriches communities, helping fire and emergency services expand their outreach efforts while still meeting their response and training goals. Fire Corps is a partner program under the Citizen Corps initiative funded through the Federal Emergency Management Agency (FEMA). The Charlottesville (Virginia) Fire Corps program teamed up with the fire department in a creative strategy to introduce the city’s growing Spanish-speaking resident population to the fire service and vice versa. By hosting the Latin American fiesta Las Posada at the fire department, residents learned about fire safety and met their local first responders. In return, the fire personnel got a chance to learn about Hispanic culture and meet their constituents. Charlottesville Fire Chief Charles Werner says, “Fire Corps volunteers will increase the efficiency and effectiveness of our firefighters. It is a great way for people to support our work and make a real difference in the community.” Read a summary of the Charlottesville Fire Corps program here. Add partners who have common interests and resources that are relevant to specific prevention efforts. A core advocate group can help you identify these individuals, organizations, and community groups. Additional partners can bring valuable resources that increase effectiveness of prevention efforts. Partners for specific programs might give you 1) access to target audiences because they are “trusted” friends, 2) language and cultural skills to increase communication and understanding with the target audience, 3) added personnel for delivering programs, and 4) opportunities to reach a broader audience through their venues. Sometimes you can’t reach the people you need to unaided. High-fire-risk communities can be isolated by a variety of environmental and socioeconomic factors. To make your fire prevention outreach more effective, it makes sense to gain community advocates that can support and enhance your efforts. A Tucson, Arizona, project demonstrates the great benefit of partnering with others in the community in order to access and gain the acceptance of the target audience. To reach homes that had a high concentration of minority residents and a high poverty rate, as well as 60 percent of the population including children and older adults, the Tucson Fire Department teamed up with the nonprofit Sonora Environmental Research Institute, Inc. (SERI). Using the “promotora” method of community outreach, SERI implemented the program in a culturally appropriate manner and language, providing fire safety education and smoke alarm installations for more than 2,000 families. The project was undertaken as part of SERI’s Department of Housing and Urban Development healthy homes production grant, allowing more homes to be reached. The SERI promotoras visited the homes to provide information as well as interventions that would improve the safety and well being of the residents. 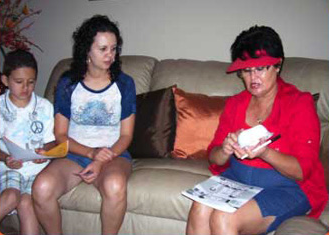 SERI utilized a home visit inspection checklist developed with the Tucson Fire Department. The program was evaluated and cost effectiveness and sustainability were documented. This program can be replicated by any fire department wanting to reach a high-risk target audience. The promotora model is widely used in the southwest, but SERI staff believe it can be modified for other communities as the key feature is to utilize well trained community members who have the target audience’s respect. You can read a complete summary of the program on the Vision 20/20 website, or you can watch a brief video about the program. Read about other models of fire prevention performance that you can replicate in your community on the Vision 20/20 website.